Shown is a Rural King store located in Xenia, Ohio. 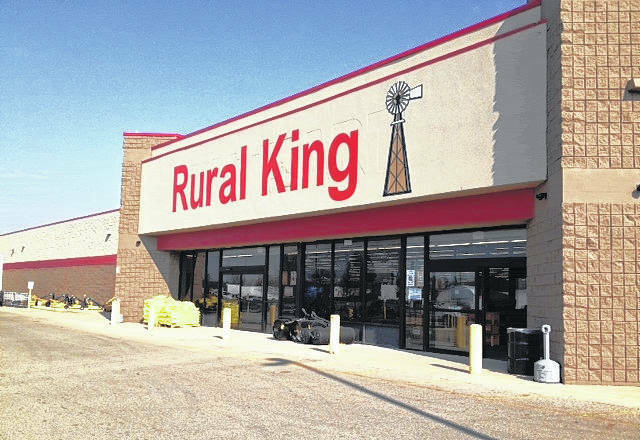 It has been nearly six months since Rural King bought the old Hillsboro Kmart building on North High Street, and as the property remains vacant, a Rural King spokesman said on Monday that it may be months or even years before the farm supply store moves in. Even when Rural King moves in, the store will not occupy the entire building, which boasts more than 100,000 square feet, Pierce said. According to Pierce, the store will work with a broker to identify “an additional tenant or two” to share the space. Hillsboro Mayor Drew Hastings said Rural King contacted the city three months ago asking if Hillsboro was offering incentives like tax abatements to “speed up the process,” and the mayor said there were none. “Some of the incentives they were looking for… I wasn’t really in favor of, so I told them we didn’t have any at this point,” Hastings said. Hastings said he did not believe that slowed the process. The building, which sits on 17.5 acres of land, was vacated when the local Kmart went out of business in January of last year. The Hillsboro location was one of 45 Kmart stores and 18 Sears stores across the country that were scheduled to shut down in January 2018. Hillsboro’s was one of five Kmarts in Ohio on the closing list. As was rumored at the time, Rural King later purchased the property for $3.5 million. That deal went through in August 2018. Ever since Kmart moved out, the building has sat empty with old newspapers taped to the inside of its glass doors. The parking lot is often occupied by utility trucks, semis and seagulls. According to a release, Rural King began in 1960 as a small, family-owned farm store in Mattoon, Ill. Now, the company is one of the fastest growing family-owned companies in America and has added more than 110 stores in a 13-state area. As previously reported, Rural King has in the past bought Kmart and Sears buildings after the stores have gone out of business. All store locations carry a variety of products, such as livestock supplies, clothing, hardware, and compact tractors from 19-55HP at select locations, according to the release. “Rural King is proud to provide all customers with the lowest prices every day, free coffee and popcorn in every store, and a friendly smile,” the release said.